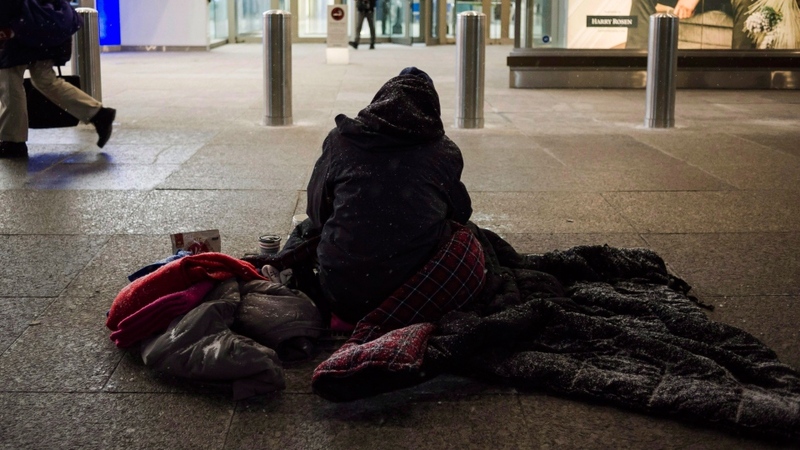 As most of Ontario endures an extreme cold snap this weekend, with some areas seeing wind chill values as low as -30 C, various groups and shelters are increasing their services to help the homeless stay warm. Environment Canada has issued an extreme cold warning for nearly the entire province, warning that the bitterly cold temperatures can cause frostbite within minutes, and those without proper shelter are the most vulnerable. Some shelters across Ontario are operating at or above capacity, and warming centres have been opened to offer a space for those with nowhere else to go. On Saturday night, an additional 35 spaces were created at a warming centre in Toronto, and a spokesman for the city said a new women's shelter is opening on Monday. In the meantime, a volunteer group is hoping to assist Torontonians on the street that can't or won't stay in a shelter. Jody Steinhauer, executive director of Project Winter Survival, said this year the organization has fielded the largest number of requests for survival kits in its 20-year history. She said more than 21,000 kits have been requested - a 60 per cent increase from last year - as there is an increasing need for the food, clothing and hygiene products the kits provide. “The numbers are just staggering,” said Steinhauer. She said volunteers got together on Saturday to put together about 3,000 kits, but the group doesn't have enough money to afford assembling the remaining kits so they will have to hold a fundraiser. “This is about stopping people from freezing to death,” said Steinhauer, adding that she hopes the additional kits can be packaged soon as the extreme cold weather continues. Earlier this month, a Toronto woman died after she became trapped in a clothing donation box - the eighth such incident in Canada since 2015. Anti-poverty advocates have called the boxes “death traps” as homeless people can get trapped seeking shelter or trying to get clothing. On Jan. 15, a man was sleeping in a laneway when he was struck and killed by a garbage truck that was reversing. “Unfortunately, nobody pays much attention until somebody dies,” said Steinhauer. Peter Tilley, executive director of the Ottawa Mission, said about 20 spaces have been added to the shelter. “We don't turn anyone away though,” said Tilley, adding that staff do their best to make room for anyone to come inside and stay warm, even if people have to sleep in the waiting room. Tilley said although some homeless refuse to go to shelters, he said it's the mission's responsibility to offer the service. He said frontline staff have increased the amount of times they check in on those on the street. Janet Mason, a lecturer on public policy at the University of Toronto, said affordable housing and transitional housing is needed as a solution to address homelessness in Ontario and get people off the streets. She said while there may be concern from provincial and municipal governments about the cost of creating the units, she believes it would be less expensive than using shelters and other resources as a temporary solution. “The shelter system gets really clogged with people that just need transitional housing, or just need affordable housing,” she said. Tilley said homelessness is not just an issue in major cities, but everywhere in the province.